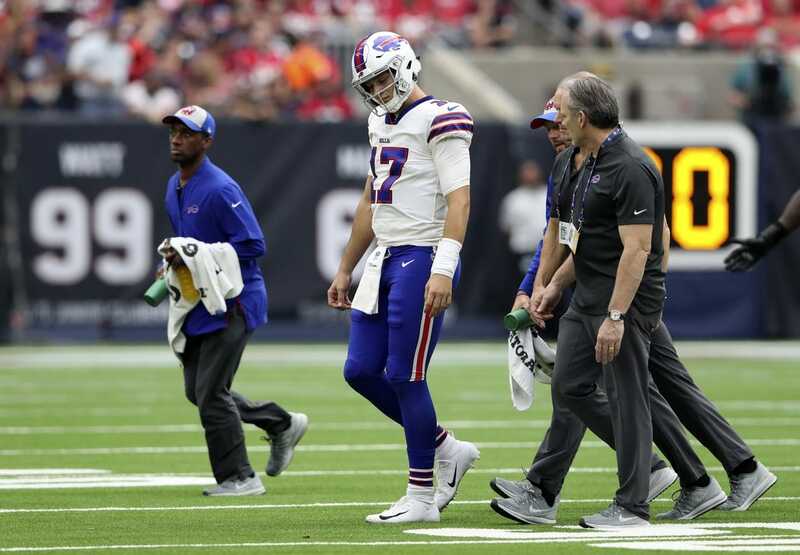 Buffalo Bills rookie quarterback Josh Allen is unlikely to play this week against the Indianapolis Colts due to an elbow injury and his status going forward could be in the hands of Dr. James Andrews. ESPN's Chris Mortensen reported Tuesday that Allen is out for Week 7 with an injury to the ulnar collateral ligament in his right elbow. Dr. Andrews is reviewing MRI exam results of Allen's throwing arm to provide guidance for the Bills' handling of the prized first-round pick, per the report. Without Allen, veteran Derek Anderson could leapfrog Nathan Peterman and start at Indianapolis. That decision is one the coaching staff in Buffalo will "work through" Tuesday, head coach Sean McDermott said. Mortensen said Buffalo determined at the time of the injury that Allen would not be rushed back, and the Bills want to be certain his arm strength returns to 100 percent before considering putting him back on the field. Allen left Sunday's game against the Houston Texans in the third quarter after being hit on the elbow by Whitney Mercilus, a hit McDermott was upset the officials did not flag. Allen did not return and was replaced by Peterman, who threw a go-ahead touchdown before tossing a pair of interceptions in the final 90 seconds, including a pick-6 that proved to be the winning touchdown for the Texans. Peterman has nine interceptions in 79 career pass attempts, raising questions about whether he should be the backup behind Allen. The team signed Anderson last week, but he remains a "work in progress" while learning the offense and developing chemistry with teammates. McDermott said all options are on the table at quarterback "at the moment." Asked if he could still start Peterman despite the turnover woes, McDermott replied, "I'm confident in every football player on our team." "With respect to Nate, it's no different," he continued. "I know he had some good plays yesterday, I know he had some plays he'd like to have back." As for Allen, McDermott lamented the reps the rookie had to miss in a critical moment due to the injury. "That's the hardest part about this is him not being able to be out there to finish the game, in those critical moments of the game to get the valuable experience," McDermott said.